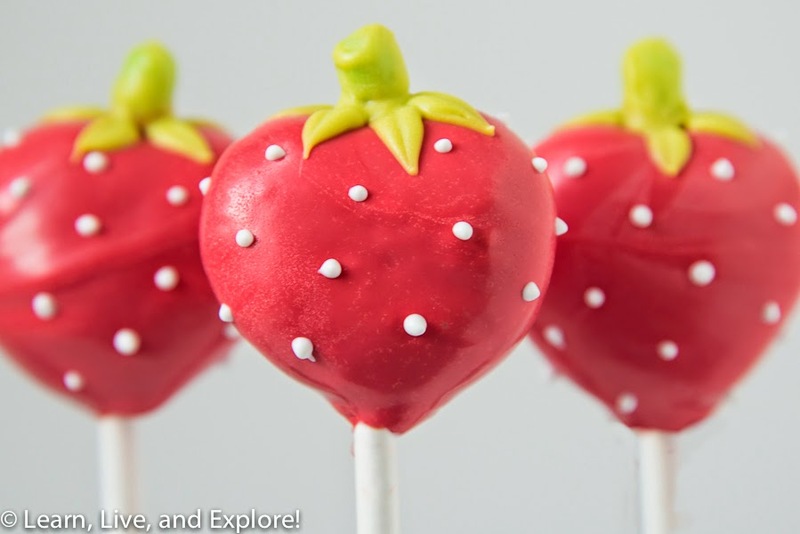 Strawberry Cake Pops ~ Learn, Live, and Explore! I have to say this first...I thought cakepops were going to be easy. I thought wrong! Cakepops have been on my baking to-do list for long time, yet my bags of sticks and bags of different colored candy melts stayed on the shelf taking up space. Well, I finally saw a design that inspired me. This time of year, May/June specifically, will always remind me of my summers going to a local farm to pick strawberries with my mom. I use the term "pick" loosely because that implies that what I picked ended up in a box in our car to take home. But, I was a kid who loved strawberries! And I'm not talking about any strawberries, but Oregon strawberries that are bursting with a moisture/flavor factor that you can never get in grocery stores. So, while my mom would pick 4 flats, my child labor resulted in, on average, maybe 1-2 flats, mostly because I ended up eating at least a flat right off the vine. And this was not an organic farm since it was the 1980s. So take that ingested pesticides! I survived! 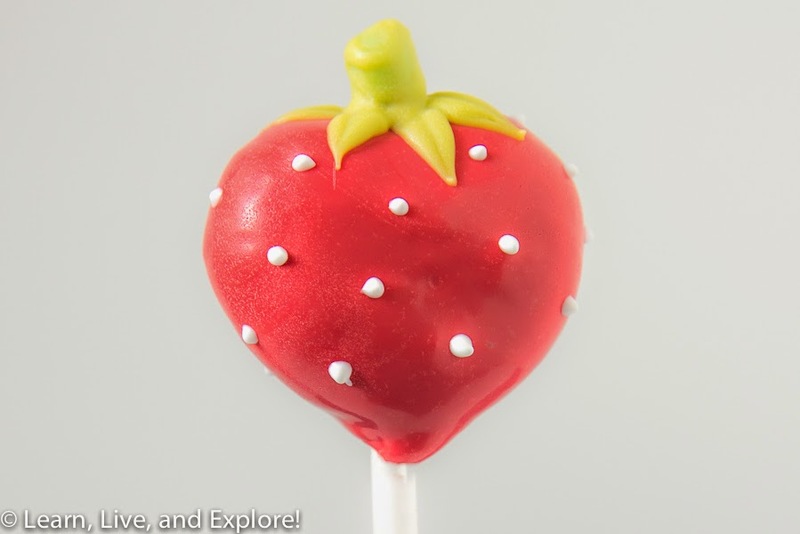 Anyway, the queen of cakepops - Bakerella - posted a strawberry cakepop design using a heart mold, and I knew this was going to be my first adventure into the world of cakepops. I couldn't find her mold for purchase, so I found an alternative one that worked as well, I think. The foundation of a cakepop is simple, but if you want the instructions, check out Bakerella's basic recipe. Start by baking a box of grocery store cake mix in a 13" x 19" pan per the directions on the box. When cooled, take the cake and crumble it up into a big mixing bowl. Take a can of icing, also from the grocery store, and mix it into the crumbles to get the cakepop mixture. For this project, I rolled balls of the mixture (about 1.5") then put them in the refrigerator on a tray lined with wax paper to chill before pressing them in the mold. 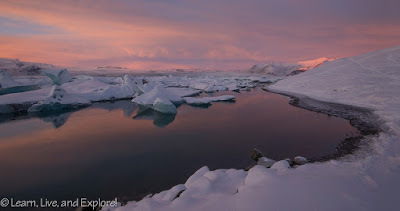 Once cool enough, I pressed each heart individually and put them back into the refrigerator to chill again. I then melted some red and white (3:1 ratio about) candy melts, took the hearts out of the refrigerator, dipped the lollipop stick into the candy melts, and slowly inserted it into the bottom of each heart. Once again, I chilled the pops (the instructions say to freeze, but chilling worked ok). It's the dipping part that frustrated me. I couldn't get it to stay smooth. Maybe the candy melts were too hot, maybe I was making the layer too thick. I was frustrated to say the least! For the decoration, once the heart was dry, I melted white candy melts and carefully made the dots with a toothpick. I then melted lime green candy melts, took a tic tac candy (any kind, but I would use a fruit, not mint flavor), and glued it to the top by dipping the end of the tic tac in the candy melts. After it was set, I took a clean toothpick, got a big glob on the end, placed the glob next to the "stem," then drew the tip of the toothpick through to get the leaf look. I then "painted" the stem green with the candy melts. While overall, not very happy with the final result of maybe 3 or 4 good pops, I think that there are some other designs with which I'd like to challenge myself in the future. I'm not giving up yet! Though ultimately, while cute, I'm not a huge fan of the taste because it's a little too moist in the middle with all the frosting needed to bind the cake into the shape. Perhaps, this is something that would go over well at a kid's birthday party, since kids will gobble up most sweet treats!